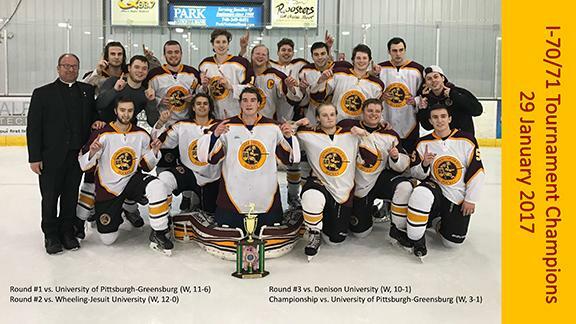 The Gannon University men’s club hockey team won the I-70/71 College Tournament again for the second consecutive year. As it did last year, Denison University played host to the tournament down in Newark, Ohio. The Knights won the tournament efficiently as they played four games in 44 hours. They kicked off the puck-packed weekend going toe-to-toe with the University of Pittsburgh-Greensburg. After a goal by Zak Tomblin seconds into the match and some high-scoring action, Gannon pulled away with the 11-6 victory. Tomblin, Josh Green, Zach Thibault, Mitchell Hillhouse, Patrick Korn and Blaine Adams scored for the Knights. Tomblin wowed the stats book nearly pulling off a double hat trick, but fell one short, scoring five goals. Game two was similar to game one in that Gannon found the back of the net many times. The Knights put a beating on the Cardinals of Wheeling Jesuit University shutting them out 12-0. John Roberts and Adams each contributed a hat trick. Other goals were scored by Tomblin, Adams, Eric Scott, Cordell Turner, Tony DeNionisio and Ian Newman. However, the most impressive stat was Korn’s five assists. In a high scoring game, someone has to be passing the puck and Korn’s unselfish play was key to the offensive success. Next on the list was host Denison University. 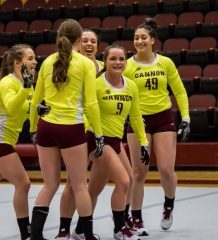 Gannon defeated the Big Red 9-1 two hours after beating WJU. Again, Tomblin, like a bullet out of a gun, hit the ice hard and scored off an assist from Adams 15 seconds into the match putting the Knights up 1-0. Gannon was able to get three more goals before Denison put a tally on the scoreboard with 51 seconds left in the first period. By the second period, Green was able to score a third goal, joining the list of Knights to have a hat trick over the weekend. At the end of the second, the Knights led 7-1. As the third period came around, Gannon took its foot off the gas, scoring two more goals leading the Knights to a 9-1 final score. Now 3-0 in the tournament the Knights would snag the No. 1 seed in the tournament and would face Pitt-Greensburg in the championship round. The Knights had been playing great on both sides of the puck in the first three games of the tournament. Despite the offense taking somewhat of a lesser role, the Knights pulled out a 3-1 victory over Pitt-Greensburg. Knowing each other’s playing style might have been a contributing factor to the lack of goals scored in the first period. However, a pass from Adams to Roberts in the second period put Gannon up 1-0. UPG answered with a goal of its own not 40 seconds later, tying the match at 1-1. A minute later, Gannon high-scorer Tomblin put the Knights up 2-1 before the Zamboni made its big appearance. The third period was pretty uneventful in terms of scoring until Pitt-Greensburg called a timeout with 3 minutes, 29 seconds on the clock, shortly after a Gannon penalty. Gannon being down a player due to the penalty provided UPG the perfect opportunity to take advantage of the power play. UPG’s coach made the decision to pull the goalie and put a sixth attacker on the ice to Gannon’s four, but the move failed to make a difference. The Rev. 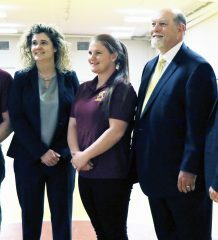 Jason Glover, Gannon’s coach, said afterward that it is always a fun tournament for him and the guys and he allows them free rein during the games. “For the most part, the games are inconsequential for league standing, so I let the guys create the game plan and play the game—line changes, defensive pairings, special teams — from ‘the cuff,” Glover said. UPG’s extra attacker didn’t deter the Knights as Korn drilled one into Pitt-Greensburg’s open net. As the clock wound down Gannon was able to capture the “Denison Cup” after the victory. However, it wasn’t an easy victory as the Knights killed two five-on-three penalties and tendy Trey Brown had to turn away many pucks to get the Knights the cup. Looking at the stat sheet, Tomblin had the most goals with nine and Korn had the most assists, passing the puck 13 times for goals. Korn also had the most points with three goals and 13 assists totaling 16 points. Adams had 10 points, Green had seven and Scott scored his first goal of the season against Wheeling Jesuit. On the power play, Gannon went five-for-15 and was three-for-22 on short-handed goals. 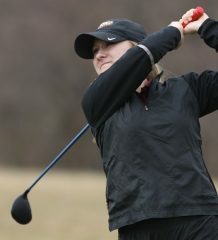 To no surprise, the Knights outscored their opponents 36-8. The wins were a collective effort as 11 of Gannon’s 14 skaters scored goals and 13 of the 14 had assists. To match their tenacious offense, the Knights also stacked up a handful of penalty minutes totaling 95, which included a disqualification and a game suspension. Glover said he is concerned with the penalty minutes accumulated over the weekend and looks to fix that. “We have to clean up our play as we move into the conclusion of our weekend and have our eyes on post-season play,” Glover said. However, hockey is one of the most physical games and it’s easy to get a little rough so I have one thing to say—it happens — but you can’t let the penalties creep up too much. Despite the penalty minutes, Glover said he is really proud of the team for more than just winning the championship. “I couldn’t be more pleased for the maturity in the way the team responded to that adversity; that’s character — how one responds to adversity.